World and Commonwealth 5000m Champion Hellen Obiri now plans to add an Intercontinental title after bagging yet another accolade on Thurdday night, winning the 5,000m title at the Africa Senior Athletics Championship in Asaba, Nigeria. Obiri added on an African crown winning the race in 15 minutes, 47.18 seconds, with Ethiopians Senbere Teferi and Meskerem Mamo coming home second and third clocking 15:54.48 and 15:57.38 respectively. “I am really happy to have added on to this African title and it is such a joy because it was a tough race. The weather conditions were not very favorable because it was so hot. 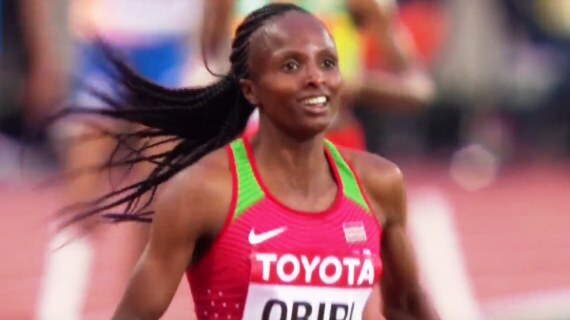 But I am glad I won and now, my next target is the Intercontinental Cup in Ostrava where I will run the 3,000m and I want to go back home with gold,” Obiri noted. The Kenya AIrforce Athlete delievered Kenya’s first gold medal at the game with the 10,000m team having failed to clinch any medals after getting into the track barely five hours after landing in Asaba after spending some 48 hours in Lagos following a logistical nightmare that saw them miss out on connecting flights. In the 5,000m race, Lilian Kasait finished fourth after clocking 6:04.51 while Loice Chemning finished in fifth placed with a time of 16:25.78. “I believe that me winning here will inspire the other Kenyan athletes to fight for medals. We were a but fatigued coming here because of the delay and that is why our 10,000m team did not get medals but now we are relaxed and I know everything will be okay,” the 29-year old further stated. On Thursday, the second day of the competition, Kenya’s Jared Momanyi and Alphas Kishoyian progressed to the final of the 400m. On Friday, Kenya will have a chance of more medals when the trio of Ferguson Rotich, Emmanuel Korir and Jonathan Kitilit line up for the 800m final. There will also be the women’s 1,500m and men’s 3,000m steeplechase finals where Kenya is further expected to charge for medals. World, Olympic and Commonwealth steeplechase champion Conseslus Kipruto will lead the hunt, looking to add another feather to his decorated cap.